The Wikileaks leaks are rather disappointing till now. Apart from a couple of juicy stories on Col Qaddafi and other leaders, nothing much that we already knew about the characters of certain Head of States (Sarkozy, Merkel, Berlusconi, etc.). So far, Tibet is cited in two cables only. There are reproduced here. Nothing new in terms of policy. Please note that in May 2009, China had only two 'core issues' Tibet and Taiwan; since then, new 'core issues' have been added by Beijing. Classified By: Acting DCM William Weinstein. Reasons 1.4 (b/d). ¶1. (C) At the regular meeting of G-5 Ambassadors in Beijing May 8, French DCM Nicholas Chapuis reported that State Councilor Dai Bingguo told visiting former French President Chirac that the West would not gain from more sanctions on North Korea. Dai reportedly said that "the lever of economic development" had not been used effectively in Six-Party Talks and that a U.S.-DPRK dialogue was "the only way to make progress." German Ambassador Michael Schaefer reported that Germany had informed China of the U.S. request to accept some Uighur detainees held at Guantanamo and had been subsequently warned by China of "a heavy burden on bilateral relations" if Germany were to accept any detainees. Japanese DCM Kunio Umeda reported that Premier Wen Jiabao was "tired and seemed under a lot of pressure" during his meeting with visiting Prime Minister Taro Aso, while President Hu Jintao was "relaxed and confident." According to UK DCM Chris Wood, China had requested the UK not allow the Dalai Lama to transit London or meet with any government officials. Wood reported that local authorities in Gansu Province had detained a British Consul, reflecting the authorities' angst over foreigners traveling to the Tibetan regions of the province. End Summary. ¶2. (C) French DCM Nicholas Chapuis hosted German Ambassador Dr. Michael Schaefer, Japanese DCM Kunio Umeda, UK DCM Chris Wood and Acting DCM May 8 for the regular gathering of Beijing-based G-5 Chiefs of Mission. ¶3. (C) French DCM Nicholas Chapuis reported that President Hu had not mentioned Tibet in his meeting with visiting former French President Jacques Chirac. State Councilor Dai Bingguo had told Chirac that the West would not gain from more sanctions on North Korea and that a U.S.-DPRK dialogue was "the only way to make progress" in Six-Party Talks. Dai reportedly said that North Korea wanted to open up economically and that the "lever of economic development" had not been used effectively in Six-Party Talks. Dai suggested to Chirac that, given China and France's "conflict of interests" in Africa, the two countries should have a dialogue on Africa. Classified By: Charge d’Affaires, a.i. Dan Piccuta. Reasons 1.4 (b) and (d). ¶2. (S) Summary Continued: XXXXXXXXXXXX raised concerns over China’s “core interests” of Tibet and U.S. arms sales to Taiwan, which he said could “derail” bilateral cooperation. The Charge raised the Liu Xiaobo and Gao Zhisheng human rights cases, to which XXXXXXXXXXXX replied with standard language about Chinese law. The Charge asked for assistance in expediting the exit from China of two North Koreans from the U.S. Embassy compound; XXXXXXXXXXXX promised to assist. The Charge urged China to press North Korea to release the two detained American journalists; XXXXXXXXXXXX said China would. XXXXXXXXXXXX expressed concern over building “momentum” on UNSC reform and asked the United States not to be “proactive” on the matter. The Charge expressed concern that differences regarding a Conditions of Construction Agreement (COCA) II for our new Consulate General in Guangzhou had begun to affect other parts of our support for each other’s practical needs including residential leases and asked for XXXXXXXXXXXX’s assistance in stopping this trend. The Charge and XXXXXXXXXXXX agreed on the importance of high-level meetings to the bilateral relationship and reviewed a number of recent and upcoming visits. End Summary. Head Li Yuanchao, it would be easier to arrange a successful visit if Li could postpone his travel to a less busy time, the Charge said. XXXXXXXXXXXX replied that the visit of Li, a “future leader of China,” was “very important,” so China hoped the United States would provide a full schedule of meetings with senior leaders despite the fact that those leaders recently met with State Councilor Liu. The Charge urged XXXXXXXXXXXX to arrange a useful schedule for Speaker of the House Nancy Pelosi, including a trip to Tibet or Tibetan areas, noting that the Speaker was also particularly interested in climate change and environmental issues. China would treat Speaker Pelosi’s visit as a type of “state visit,” XXXXXXXXXXXX replied. Nevertheless, given her “tight schedule,” the Speaker would likely “not have time” to visit Tibet, XXXXXXXXXXXX said. ¶15. (C) XXXXXXXXXXXX raised concerns over China’s “core interests” of Tibet and Taiwan, which he said could “derail” bilateral cooperation. On Tibet, China had heard “rumors” that the Dalai Lama would attend a “seminar” in the United States in late September or early October, and that President Obama was “likely” to meet with him then. Noting that there was no need for both sides to reiterate our respective positions on Tibet, XXXXXXXXXXXX said the critical question was whether both sides would agree to “take care” of each other’s “core interests.” When considering such sensitive issues in the context of the bilateral relationship, they could be viewed either as “obstacles” or as “core interests.” It did not matter whether one side “liked or disliked” such matters; rather, in a “mature, close and important” bilateral relationship such as ours, the question was whether the key interests for each side would be accommodated. The United States had its core interests, XXXXXXXXXXXX asserted, such as U.S. naval vessels that had operated near the Chinese coast. Both sides agreed to “step down” over that issue, despite the strongly held views of the Chinese public. Regarding the Dalai Lama, China hoped the United States would deny him a visa, and if not, then agree to hold no official meetings with him, including no meeting with President Obama. ¶16. (C) The Charge expressed concern with China’s defining Tibet as a “core issue” with the apparent expectation that others would “step back.” Instead, our two sides should agree to continue to discuss the issue in an attempt to resolve our differences. The United States recognized that Tibet is a part of China. Nevertheless, the Dalai Lama is a respected religious leader and Nobel Laureate, and U.S. officials meet with him in that capacity. Future meetings by U.S. officials with the Dalai Lama could not be ruled out. Moreover, there were serious concerns among the U.S. public, the Administration and Congress over the situation in Tibetan areas of China. China should take steps to address Tibetans’ legitimate grievances and engage the Dalai Lama’s representatives in productive dialogue. Denying a visa to the Dalai Lama was not being contemplated. Recently the Dalai Lama declared that ‘he was contemplating retirement within months’. He however quickly added that the ‘final decision will be taken after consultations with the [Tibetan] political leadership and Parliament-in-exile’. He later explained "I want to inform them about my intention although I briefly mentioned (about it) already." When requested to give a date, he said: "I do not know; may be next few months." The Indian (and foreign media) also immediately titled: “The Dalai Lama to retire soon”. China immediately reacted. A Communist Party scholar Zhao Gancheng of the South Asia Studies at the Shanghai Institute for International Studies., confided to The Global Times: “the Dalai Lama just wants to manipulate the choosing of the next Dalai Lama so as to find one who he believes could take over his separatist activities." This is of course pure propaganda. Is it not strange that Communist China which has always considered religion as a poison, now claims skill in locating reincarnations of senior Lamas? If the Tibetan leader is planning to scale down some of his ‘political’ activities, there is another reason. 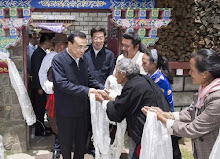 He points out, “if the Tibetan people take their responsibility, that way I will have more energy and time to do some other work that you cannot do”. The Dalai Lama would like to give more time to the exploration of a convergence between science and spirituality. 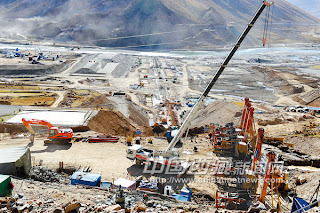 China announces the construction of one more dam in Tibet. This time near the Tibetan capital on the Lhasa river. 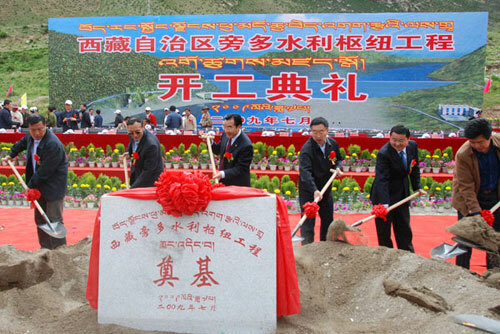 It was inaugurated by Zhang Qingli and Jampa Phuntsok, the bosses of Tibet in July 2009. One report mentions the cost as 700 million yuan while the other says 4.5 billion yuan. A small difference!! 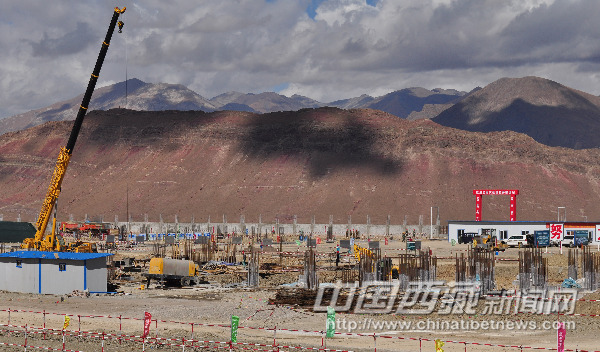 Currently, the construction of Phomdo project is going on smoothly, according to the project office in Lhasa, capital city of southwest China's Tibet Autonomous Region (TAR). The cut-off wall, reported as the world's highest of its kind, was completed on Oct.12, 2010.
participating in the groundbreaking ceremony, July 16, 2009. Phomdo dam project as the largest project of Phomdo water control project is expected to start the construction in this May, with the total investment of 700 million yuan. At present, the Phomdo water control project started in July 15, 2009 is making good progress with the open tender of dam safety monitoring system, highway improvement project carrying on well. 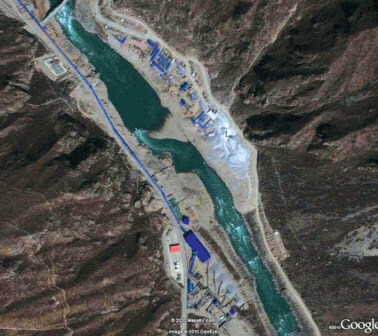 Phomdo water control project as the backbone water reservoir project at the upstream of Lhasa River, has the total reservoir storage capacity of 1.23 billion cubic meters, and 160,000 kilowatts installed capacity. It will play an very important role in developing integrated water resources of Lhasa River, enhance the flood control capacity, and improve the ecological environment in Tibet. Located in Lhunzhub county, 67 km away from Lhasa, capital of the Tibet Autonomous Region (TAR), the Phomdo Water Control Project is expected to start construction thoroughly this year with the investment estimation of 4.5 billion yuan, according to TAR Water Resources Department. As a project for Lhasa River, Phomdo Water Control Project will offer irrigation water for more than 700,000 mu land of lower reaches of Lhasa River, which will boost the local grain production. "We will make preparation fully to ensure that this project can start construction in full swing this year, " said Pema Wangdu, head of TAR Construction Department. 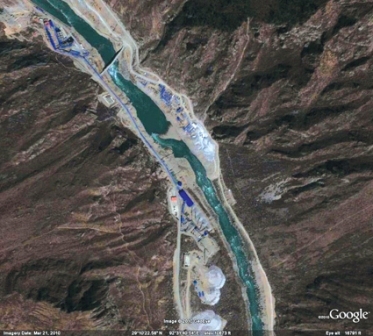 The Phomdo Water Control Project was approved officially by the central government in 2008 and part of the project has been under construction. Will the Dalai Lama retire? The Dalai Lamas of Tibet have traditionally two hats, a spiritual and a temporal one. Recently the present Dalai Lama, the Fourteenth said that ‘he was contemplating retirement within months’. He however quickly added that the ‘final decision will be taken after consultations with the [Tibetan] political leadership and Parliament-in-exile’. He later explained "I want to inform them about my intention although I briefly mentioned (about it) already." When requested to give a date, he said: "I do not know; may be next few months." The Indian (and foreign media) immediately titled: “The Dalai Lama to retire soon”. But retire from which job? It is said that the present Dalai Lama still takes this vow every day. Therefore there will be no spiritual retirement for the Dalai Lama. As far as the ‘political’ retirement is concerned, the present Dalai Lama has regularly expressed the ‘wish’ to retire. The main reason for this is that he considers that as a political system democracy is far superior to theocracy. Over the years, he had to struggle against his own fellow countrymen to impose democracy to the Tibetan Diaspora. As early as 1963, he had stated: "Even prior to my departure from Tibet in March 1959, I had come to the conclusion that in the changing circumstances of the modern world, the system of governance in Tibet must be modified and amended so as to allow the elected representatives of the people to play a more effective role in guiding and shaping the social and economic policies of the State. I also firmly believed that this could only be done through democratic institutions based on social and economic justice." The democratic system entered gradually into the Tibetan psyche; first with the election of a Parliament-in-exile, then with the direct election of a Kalon Tripa or Prime Minister for the Central Tibetan Administration located in Dharamsala, Himachal Pradesh. The present Kalon Tripa, the eminent monk-scholar, Prof Samdhong Rinpoche is due to retire early next year and a first round of voting has already taken place. Early 2011, six candidates will fight for the coveted post during a second and final round. The experiment has generated a lot of excitement and hope in the Tibetan community. The recent declarations of the Dalai Lama have to been seen in this perspective. 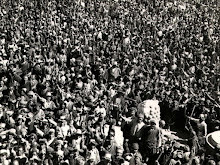 Having pushed down the throat of the Tibetans the concept of democracy, it is logical that he resigns or at least consult the elected leaders (parliamentarians and the new Kalon Tripa) though they undoubtedly will ask him to continue provide leadership until an acceptable solution is found with the People’s Republic of China on the future status of Tibet. The Dalai Lama is not only an institution, but also a ‘private’ human being. As such his personal philosophical thought has evolved since 1959. In the 1980’s, he developed the concept of ‘universal responsibility’ for which he was awarded the Nobel Peace Prize in 1989. A few years ago, I had a long interview in which he explained his personal vision of his role and the place of Tibet in it. This explains his so-called resignation. When asked if there was an order in these commitments, he immediately retorted: “Yes, it is in this order. As a fellow human being, promotion of human values is my first priority; this covers 6 billions of human beings. Then, I am a Buddhist, and as a Buddhist I want to promote religious harmony: it addresses perhaps half of these 6 billions who are religious believers. The third one is about Tibet. There is 6 millions of Tibetans. If you take [in consideration] the Tibetan environment, there are more than 100 millions of human beings dependent on Tibet. North India, Pakistan and Bangladesh depend on rivers flowing from Tibet like the Indus or the Brahmaputra in India; the Mekong in Indochina, the Yellow River or Yangtze in China and many others rivers. He could not stop laughing. He was quite happy at his own joke. Another argument is if the Tibetan people take their responsibility, “that way I will have more energy and time to do some other work that you cannot do”. What is the other work that others cannot do? One example can be given: last week in Delhi, the Dalai Lama initiated a dialogue between science and spirituality. 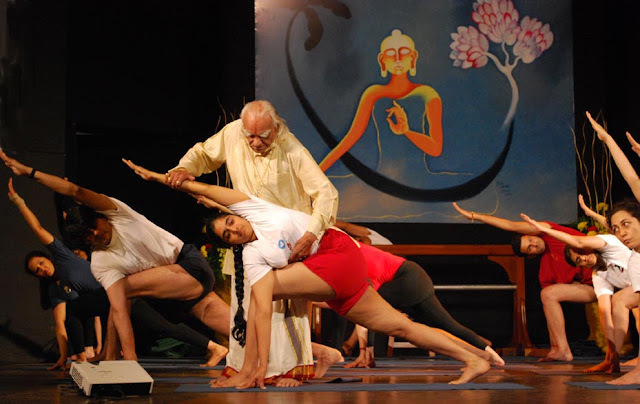 The Mind Science Conference was organized by the Mind Life Institute from the United States and the Foundation of Universal Responsibility based in Delhi; The National Institute of Advanced Studies, Bangalore, and the Central Tibetan University, Sarnath also participated. The entire exercise was the brain child of the Dalai Lama who has been meeting reputed scientists for the past 25 years to see if meditative practices can be corroborated by modern science. The main theme was ‘the emerging field of Contemplative Science which can investigate the effects of contemplative practice on human biology and behaviour’. Apart from world famous scientists, former President APJ Abdul Kalam and renowned yogi B. K. S. Iyengar provided valuable inputs. At one point the Dalai Lama said that traditionally the Buddhist have taken three refuges, in the Buddha, the Dharma and the Sangha; he suggested that the time had perhaps come to add one, Science. For him, if a religious belief contradicts modern science, it should be discarded. In the meantime, the people of Tibet through their elected representatives will certainly ask him to continue to guide their destiny for the years to come. My article Tibet isn't Kashmir appeared in The Pioneer today. You can read by clicking here. To the surprise of many, External Affairs Minister S.M. Krishna recently told his Chinese counterpart Yang Jiechi that New Delhi expects Beijing to change its position on Jammu & Kashmir by reciprocating the way India has handled Chinese ‘core issues’. It is the first time that India has equated Jammu and Kashmir with Tibet. This happened during a 70-minute bilateral meeting during the Russia-India-China trilateral Meet. This issue started when Beijing began issuing stapled visas for Kashmir residents. Apparently China wanted to make a point: Beijing does not recognize J&K as an integral part of India. Later Beijing denied a visa to Lt Gen BS Jaswal, Northern Command boss, to attend a preplanned defense meeting in Beijing. To make matter worse, the Chinese Embassy stated that the General was serving in the ‘sensitive location of Jammu and Kashmir’ and ‘people from this part of the world come with a different kind of visa’. Interestingly, the position of China has historically been quite clear: Beijing wanted Pakistan and India to solve the ‘K’ issue bilaterally (even though Beijing’s favours have always heavily tilted towards Pakistan). This has remained Beijing’s policy for decades, but since a few months, things have changed. China’s Foreign Minister Yang was ambiguous in his response to S.M. Krishna. Could it be otherwise? Today, it is clear that it is not him who decides China’s foreign policy. However, the use of the ‘K’ Card by Beijing is new, at least in this open and deliberate manner. How can it be explained? To understand the issue one should look at a larger perspective. India is not alone to face the problem. In recent months, Japan, Korea and other China’s neighbours have encountered Beijing’s change of mood. Most watchers agree that it is due to the accrued interference of the People’s Liberation Army in China’s foreign policy, sometimes in opposition to the ‘civilian’ State Council’s positions (the theory of the ‘Peaceful Rise of China’ seems, for example, to have been forgotten). The jockeying for key positions in the next Politburo and its mighty Standing Committee as well as the coveted seats in the Central Military Commission probably explains the Chinese latest moves. 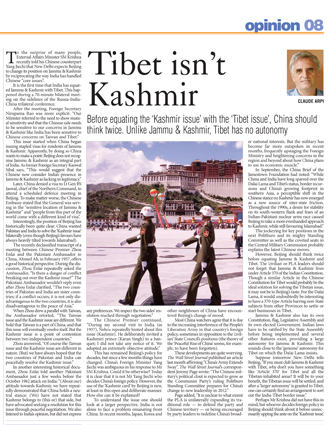 However, Beijing should think twice before equating Kashmir and Tibet. The ‘civilian’ or PLA’s leaders should not forget that J&K lives under the Article 370 of the Indian Constitution. Though a similar article on the Chinese Constitution for Tibet would probably the ideal solution for solving the Tibetan issue, it may not be to Beijing’s taste. For the Dalai Lama, it would undoubtedly be interesting to have a 370-type article barring non State subjects from other Provinces to settle or start businesses in Tibet. J&K has also its own Constitution, flag, Legislative Assembly and its own elected government; Indians laws have to be ratified by the J&K Assembly before being implementable and several other features providing a large autonomy for the State. This sounds close to the ‘genuine’ autonomy on which the Dalai Lama insists. S.M. Krishna did not perhaps have this in mind, but whoever decides the foreign policy in Beijing should think about it before unnecessarily rattling the ‘K’ issue. The Indian press seems surprised by the announcement from Beijing that the Zangmu Dam on the Yarlung Tsangpo (Brahmaputra) has started. In fact, it is well on the way as these pictures from Google Earth show. Why waking up so late? 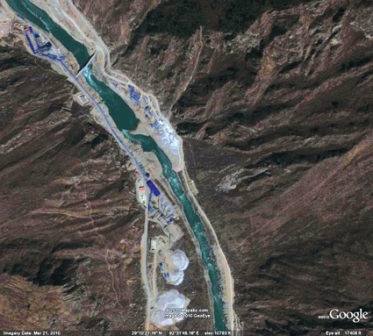 Four or five other dams will follow soon the first one in Zangmu. A few months back, I mentioned about another dam being constructed on a tributary of the Yarlung Tsangpo, nobody seems to have noticed. What about India? We will probably never know, but if they can do it to the Pentagon, the same e-pirates can certainly do it to South Block or the Army Headquarters. And 18 minutes is a long, long time. This is the new form of warfare and the Middle Kingdom is far in advance on its opponents at this game. To read the US Report, click here. The Chinese answer is posted on The Global Times. U.S. government and military Internet traffic was briefly redirected through computer servers in China earlier this year, according to a report that is to be released by the U.S.-China Economic and Security Review Commission on Wednesday. The report says telecommunications companies in China disrupted the Internet for only about 18 minutes -- but they were a big 18 minutes. They "hijacked" about 15 percent of the world's online traffic, affecting NASA, the U.S. Senate, the four branches of the military and the office of the Secretary of Defense. 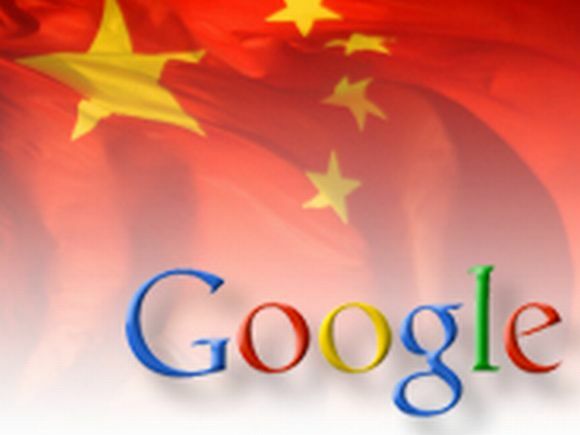 A draft copy of the report, obtained by ABC News, said, "For about 18 minutes on April 8, 2010, China Telecom advertised erroneous network traffic routes that instructed U.S. and other foreign Internet traffic to travel through Chinese servers." While the Internet "hijacking" incident was initially reported on in April, it had not been previously disclosed that the U.S. government was affected by the incident. "This incident affected traffic to and from U.S. government (''.gov'') and military (''.mil'') sites, including those for the Senate, the army, the navy, the marine corps, the air force, the office of secretary of Defense, the National Aeronautics and Space Administration, the Department of Commerce, the National Oceanic and Atmospheric Administration, and many others. Certain commercial websites were also affected, such as those for Dell, Yahoo!, Microsoft, and IBM." 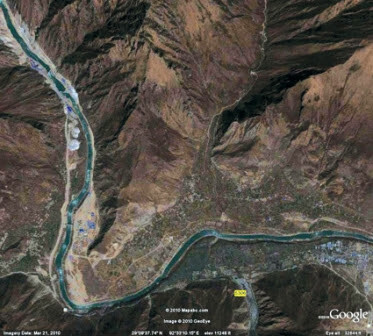 Yesterday the Indian press commented on the official announcement by Beijing that the construction of the Zangmu dam on the Yarlung Tsangpo (Brahmaputra) has started (it was an open secret). In this context, I am reproducing here an extract of a book written by Jonathan Watts, the correspondent of The Guardian in China, When a Billion Chinese Jump: How China Will Save Mankind - Or Destroy It (2009, Faber & Faber). The extract relates to the ambitious plan to divert the Brahmaputra to Northern China. This plan is a brainchild of Guo Kai, a retired Chinese General who worked closely with Li Ling, the author of Tibetan Waters will save China. They proposed to built a Shuotian Canal. 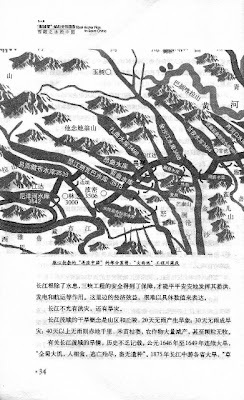 The purpose of Shuotian Canal (朔天運河) [The name Shuotian comes from the contraction of the origin of the canal near Shuomatan and the city of Tianjing at the end]. is to transport 206 billion m3 of water from Tibet to the north or western north China area where there is drought or a lack of water. At same time, the flood in Yellow river can be eradicated, inland water transport in north China can happen, and the flood in Bangladesh and India will be prevented. Chapter Four argues how Shuotian Canal can benefit Changjiang [Yangtze] River. 1. In 1300 years between Tang(唐) to Ching or Manchu (清) dynasty, total there were more than 223 floods. The flood mainly comes from the downpour within the area of Ya-an and Mt. Emei in Sichuan, where it may rain from 219 to 264 days a year. 2. The flood went out of Three Gorges (三峽) and made Jingjiang [Yangtze] (荆江) River a critical area for flood disaster. So, Chinese govt. started the flood diversion of floodwater in Jingjiang [Yangtze] Area. 3. Even though many measures have been taken, the capacity of Jingjiang [Yangtze] river, below 80 thousand m3 per second, is still not enough to prevent from a large flood disaster. Shuotian Canal can solve the root problem of the source of the flood. Guo Kai said the flood in the upper course of Changjiang [Yangtze] happens 15 days a year with the total quantity of 50 billion m3 and if Shuotian Canal is built with 16 dams in the upper course of Changjiang [Yangtze], it can have a reservoir with the capacity of 280 billion m3 and the water can be diverted to the north in the speed of 30 to 40 thousand m3 per second. Thus, Changjiang [Yangtze] river can defend any large scale flood, and then Three Gorges can be safe, whose economic values can hardly be stated. 1. If there is no rain in Changjiang [Yangtze] river for 20 days, then the phenomenon of drought starts; if no rain for 40 days, then the drought disaster happens; no rain for more than 40 days, then the crops will be decreased and even no agriculture can continue. 2. Three Gorges can still supply the water during the drought for Changjiang [Yangtze]; however, its capacity cannot support for 3 years drought. Shuotian Canal can transport the water from Nujiang [Salween] River, Lancang-Mekong River, and Brahmaputra to Changjiang [Yangtze], which make sure Three Gorges can function properly to supply electricity and its transport can be maintained. The challenges facing the western leg have proved more difficult still. Under the government's blueprint, 17bn cubic metres of water were supposed to be pumped from the Jinsha, the headwater of the Yangtze, at an altitude of 4,100m on the Tibetan Plateau, down to the Yellow river. Crossing these highlands will require pumping stations and tunnels. It will be hugely expensive and politically difficult. Downstream provinces, including the major industrial centres of Nanjing, Wuhan and Shanghai, fear they will end up dry because the Yangtze is already showing the strains of overuse, overdamming, climate change and pollution. 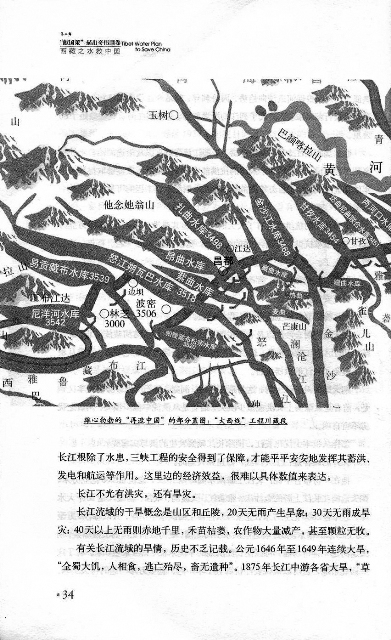 In 2006, several dozen scientists in Sichuan published a collection of memorandums that called into question the feasibility and desirability of the western leg. It began to look like a mega-project too far, even for China. The plans submitted by the Ministry of Water Resources were postponed indefinitely. Influential supporters of the scheme started to backtrack. The scheme was not dead but its future was increasingly uncertain. The debate suggested the Maoist approach to development 'think big, move fast and worry about the consequences later' - was belatedly being called into question). Even the most audacious Chinese engineering visionaries were discovering limits to what man could or should attempt in the campaign to conquer was 'think small', or so it seemed. For the environment, that was good news. But for at least one member of the Old Guard, it was lamentable. Guo Kai was a survivor of the Yugongyishan, mountain moving generation of Maoists. While the rest of humanity looked on in awe at the grand hydro-engineering schemes of modern China, the retired general told me he was frustrated by the nation's lack of ambition. I met Guo in a teashop. He looked very much the pensioner, dressed in thick layers of vests, shirts and cardigans as he explained his world-transforming plan to me. Along with his chief collaborator Li Ling, another retired officer from the second artillery division, we talked over glasses of green tea that were too hot to hold, much like their proposal has been since it was first mooted in 1976. The two military men wanted to redraw the hydrology of Asia. Pointing on a vividly coloured map of Asia's river systems to the four thickest blue veins coursing through Tibet, Guo said only one, the Yangtze, ran east to China. The others flowed south to form the Brahmaputra in India. 'The rivers cross the border. It is a waste. The water is needed here. Look how dry China is.' And with that his finger moved north to Xinjiang, Gansu and Inner Mongolia, where the map was indeed marked with huge brown and yellow splodges of desert. Fixing the problem, he said, was a simple matter of logic. India and Bangladesh get so much rainfall they often suffer from floods. If China, with a seventh of the precipitation, diverted a third of Tibet's rivers for its own use, he argued, all three nations could benefit. Not surprisingly, politicians in Delhi and Dhaka are unwilling to donate even a drop from the Brahmaputra, which they consider vital for irrigation and drinking supplies. Indian newspapers have expressed outrage at Guo's idea. If Beijing were to ever formally adopt such a plan, there would be a high chance of a water war between Asia's two most populous nations. There is no sign of this happening any time soon. Despite the support of several old generals, Guo and Li have been politely shunted aside by the politburo. Fiercer critics dismiss them as eccentric has-beens. Guo's hydrological training was not just old-school, it was no-school. He taught himself about river systems while locked in a cellar by Red Guards during the Cultural Revolution. A hydrological study of western China was one of the only books in his makeshift cell. Criticised by the young ideologues and filled with self-doubt, he devoted his detention first to the book and then to drawing up a plan to solve China's water problems. It was to become a lifetime obsession. But his reputation was not helped by an association with a still-bolder and more bizarre plan to use nuclear weapons to blast a 2km-wide air tunnel through the Himalayas that would allow warm moist currents from the subcontinent to circulate north. The general calculated that 200 warheads, each with the power of the Hiroshima bomb, would be needed to clear the necessary 3 bn cubic metres of rock. The proposal to shift the planet's most immovable object raised eyebrows even in mountain-moving China. Guo was ridiculed. One of his associates Mu Qinzhong ended up in prison. Guo distanced himself from that crazy scheme, but he has not completely given up on his revolutionary solution to China's water shortage. Fortunately, more cautious heads have prevailed. Guo's failure was revealing and, from an environmental perspective, encouraging. Although the old Maoist beliefs live on in grand nature-conquering schemes, they are now contending with rival ways of thinking that take more account of environmental limits. A new generation of scientists, journalists and conservationists are questioning the fundamental tenets of nation building with the tacit support of senior leaders. They are a source of hope that the Scientific Outlook on Development might one day prove a stepping stone onto a sustainable path between Daoism and Maoism. A new generation of scholars and politicians are far better educated than their predecessors, many of whom secured posts through political contacts during the Cultural Revolution (when most universities were closed). Rather than battle nature, this new wave seeks to understand man's place within it. Instead of expansionist mega-projects they focus on grass-roots conservation work. Instead of using science to support political dogma, they see it as a means to pursue truth and efficiency. Instead of secretive, top-down planning, they champion bottom-up accountability and transparency. And, most importantly, they have a different view of nature's limits because the y are confronted on a daily basis with the foul consequences of pollution, depleted resources and hard-to-maintain mega-projects. Even some of the old-timers agree it was time for a rethink. But they are not in the driving seat. Mao's view of nature has not yet gone the way of Mao's view of politics. Momentum is a powerful force in a country the size of China. 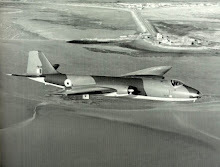 Once started, engineering schemes are difficult to stop. Once locked into a certain technology, more spending is often required to deal with the unforeseen consequences. Dams are a case in point. Hydroelectric plants appear to be green, because they emit no carbon. But the reality in Sichuan and Yunnan is often the opposite. After many dams are built, dirty factories and coal mines soon follow. Because hydroelectricity generated in remote mountain areas cannot be economically supplied to the national grid, local governments encourage chemical and smelting plants to move near to dams. Those energy-intensive industries require a constant supply of electricity, which dams are unable to provide in the dry season. The only way to avoid seasonal fluctuations is to open coal-fired power plants to provide supplementary energy. For that to be viable, mines have to be dug close by. The result of this cycle is that clean energy turns dirty very quickly. The consequences are alarmingly apparent in southeast Sichuan, where verdant hillsides are speckled with black coal mines. Some of the world's dirtiest industries are moving into this spectacularly beautiful area. 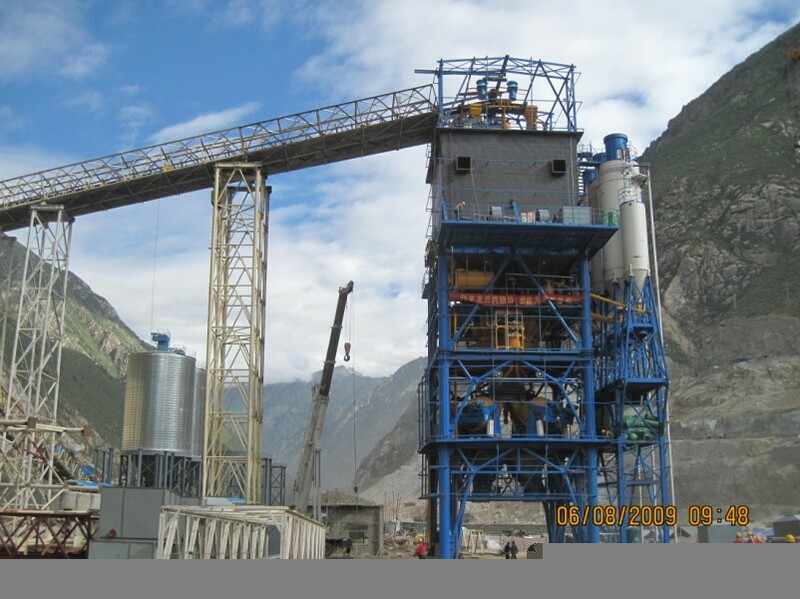 Panzihua and Zhaotong have become hubs of production for yellow phosphorus and other heavy-polluting, energy-intensive processes that have been phased out elsewhere in the world. Hydro-plants along the Jinsha (the Yangtze headwater) lead the way. Ironically, many of those same dams qualified for carbon credits under the Clean Development Mechanism even as they helped to foul an area not far from Shangri-La. Similarly, one dam often spawns others. A major reason for the cascade of hydroelectric dams on the Jinsha is to ease the build-up of silt at the Three Gorges. It is a similar story on the Yellow river. As the dams expand, so does the influence of the power companies behind them. From 2000 to 2002, China experienced a rush for hydropower as five newly created utilities, Huaneng, Huadian, Zhongdiantou, Guodian and Datang, divided up the major unexploited rivers of Sichuan and Yunnan. These firms are extremely powerful. Their heads rank at vice-ministerial level in the political hierarchy but they often also exert informal influence through family ties. Though nominally under the jurisdiction of the most powerful body in government, the National Development and Reform Commission, the utilities can often evade the full societal and environmental costs of their operations. But they have occasionally been defeated. One of the greatest reversals for the hydropower lobby occurred at Dujiangyan. Along with Zipingpu, a second dam had been planned nearby at Yangliu Lake which would have flooded the ancient waterworks. The local authorities and power companies knew this was controversial and started construction work in secret, but even with China's strict censorship controls, it was not easy to hide a dam. After the plan was exposed, a coalition of heritage officials, seismologists, environment groups, academics and journalists mounted a successful media campaign to block the project. In 2006 the Sichuan governor backed down. This landmark victory was hailed as a sign that authoritarian China was becoming more politically pluralistic, conservation-orientated and responsive to public opinion. But it was not so much a defence of nature from man, or a triumph of Daoism over Maoism; rather it was a patriotic campaign to maintain a cornerstone of the nation's heritage. A similarly nationalistic motivation would be hard to drum up for other conservation projects. Like the growing academic and journalistic criticism of megaprojects, the campaign to save Dujiangyan was encouraging, but not yet a sign of a dominant new trend. With the former Sinohydro employee Hu at the nation's helm, the influence of dam builders has increased. 'Scientific Development' has sidelined mountain-moving dreamers like Guo Kai, but it has given more influence to corporations that can pay for academic reports to justify commercially driven projects and use political ties to suppress critical coverage in the domestic media. Hydroelectric energy is increasingly important for China's energy security and profitable for the utilities. Plans to develop the Nu and the Jinsha have been held up, but the pressures to build dams on every river are growing along with the risks to people and the environment. 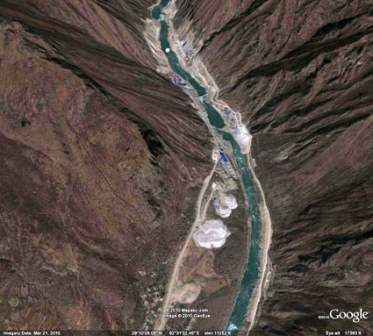 Now it is official: the Chinese are building a dam on the Brahmaputra (Yarlung Tsanngpo). We knew it for many years, but now The People's Daily has officialized it. The interesting angle is that Beijing chose the time SM Krishna, the Indian Foreign Minister was in Beijing to make the news 'official'. What has escaped the Indian press is that China has been working in parallel on the Qinghai-Tibet Power Grid Interconnection Project. According to China Tibet Online: "The Qinghai-Tibet Power Grid Interconnection Project has gone smoothly since it started construction. Currently the Tibet section for the project has poured 50% of the concrete foundation. The Qinghai-Tibet Power Grid Interconnection Project is the world's longest DC transmission line at the highest altitude and the most difficult to construct, which is expected to end the history that TAR has a separate power line." It means that Beijing is preparing to send the electricity produced in Tibet to the mainland. It also means that more dams will be build on the Brahmaputra and other Tibetan rivers to 'feed' the Chinese economy. The Brahmaputra River, which has long been praised as a "heavenly river," was dammed for the first time on Nov. 12, indicating that the Zangmu Hydropower Station, the first large hydropower station in Tibet, will soon begin its main construction. The Brahmaputra River originates in China's Qinghai-Tibet Plateau and is the world's highest river. The huge gap between the highest and lowest points of the river and the heavy river flow help ensure abundant water resources. 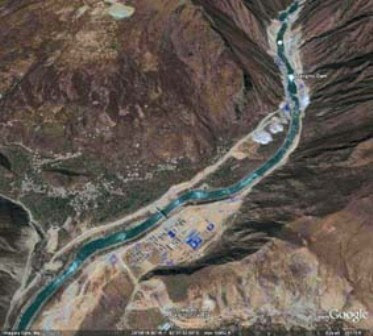 The Zangmu Hydropower Station is located in the middle reaches of the Brahmaputra River in Gyaca County, Lhoka Prefecture, Tibet Autonomous Region. With a total investment of nearly 7.9 billion yuan, it will have six 85-megawatt generating units installed, which will bring the total installed capacity to 510 megawatts. It will be the first large hydropower station in Tibet, and its first unit will be put into operation in 2014, which will greatly alleviate the power shortage in central Tibet. The hydropower station is about 325 kilometers away from Lhasa, and its average annual generating capacity is expected to reach 2.5 billion kilowatt hours. Its main function is power generation, but it can also be used for flood control and irrigation. 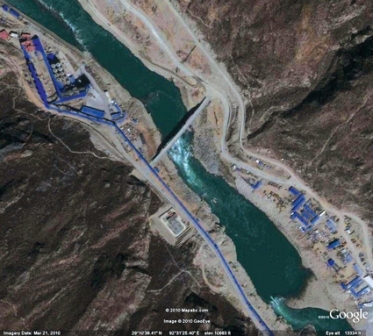 The hydropower station is a key project included in Tibet's 11th Five-Year Plan. At present, Tibet has only hydropower stations with the installed capacity of up to 100 megawatts, but soon it will have a hydropower station with a total installed capacity of more than 500 megawatts. Can you believe that this conversation between G. Partharathy (sr) and his Chinese counterpart took place 49 years ago. What has changed in 2010? Today's The Global Times says: "Chinese State Councilor Dai Bingguo is set to fly to New Delhi at the end of the month for the 14th round of border talks between China and India. Dai is expected to meet with Indian National Security Adviser Shiv Shankar Menon. The two officials might discuss Wen's visit to India next month. 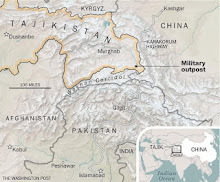 Despite the upcoming spate of meetings between Chinese and Indian officials, New Delhi recently built up its military strength in border areas with China, according to the Financial Times. A military battalion of around 5,000 troops named after 'Arunachal Pradesh', India's name for southern Tibet, was formed this week to 'defend the northeastern state', the report said." One does not see how this issue could be sorted out, though Wang told Parthasarathy: "The two sides should meet halfway - it is possible to resolve the issues". Beijing is still probably ready to exchange the Aksai Chin against Arunachal, but this is rightly not acceptable to Delhi. The discussions are stuck due to a basic issue which has to be solved before talking about borders: the autonomy of Tibet. Once autonomy is granted the border issue will become 'softer'. Is Beijing ready? PS: Please note that this document is from the Chinese archives, Delhi is still keeping 50 year-old documents under wraps in the almirahs of South Block. 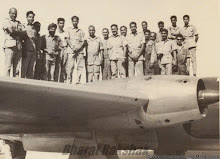 Time: 17 July 1961, 9 a.m. – 12 p.m.
(1) Both countries have expressed the need for friendly [relations], and from a long-term point of view, friendship between the two countries will still prevail. (2) The situation over the last few years has been unsatisfactory, and both sides have differing views as to the cause, but both think we should adopt a positive attitude and improve relations with constructive steps, and at the very least not add to the difficulties or make the situation get worse. (3) In order to seek solutions and advance understanding together, the two sides both hope that each can feel and understand the other’s predicament; at the same time, each also need to put themselves in the other’s shoes and make allowances for them. In today’s informal, friendly conversation, if the Ambassador has views he wishes to be conveyed to my countries’ leaders, [I] will be certain to report them faithfully and make [sure] that both sides have a correct understanding. Parthasarathy: [I] welcome Director Zhang’s opening remarks. I am in almost total agreement with your assessment. The Foreign Secretary and I both consider the two sides’ free, candid talks to be the most beneficial ones. Although the disagreements have been somewhat intense, it is still better to speak what is on our minds. This is a vital matter involving the friendship of one billion people. We have a responsibility to promote the restoration of relations, [and] it is no good to not speak what is in our hearts. We have divided the issues into two aspects. One aspect is specific, predominant issues; [these] can be boiled down to border issues. Another aspect is other factors that have caused the two countries’ relations to worsen these two years. We feel that the Chinese leaders’ sentiments toward India lack understanding in some aspects. For example, on such issues as Bhutan, Sikkim, Pakistan, and criticism in the newspapers, the difference of opinions between the two sides has widened. China’s leaders gave a fairly lengthy explanation on the issue of criticism in the newspapers, making mention of their views and the reasons for criticism. What worries me are not the criticisms themselves, but whether they signify a change in [China’s] assessment of India. We two countries have different social and political systems, but [their] goal is still the same; it is only that the methods [we] use to attain that goal differ, that’s all. The reports in Chinese newspapers cause people to feel that there have been major changes in India’s domestic and foreign policies, as if India has become reactionary, no longer progressive. This is a lack of respect for India. It is very difficult to bring the two countries’ relations back to normal. Zhang: I very much appreciated the way you put it; there are disagreements, but [we] must consider things as a whole. As long as we [do so] for the sake of honesty, there is nothing to fear in talks being somewhat sharp. This is much better than mutual criticisms in official letter exchanges and in public opinion. [We] must not create public tension; the governments both feel pressured, [and it] runs counter to both sides’ desire for improvement. [As for] criticism in the newspapers, India’s criticisms far outnumber [China’s]; we don’t attach much importance to it. Our newspapers have also carried some news about India that is entirely of a reporting nature, [with] almost no comment. 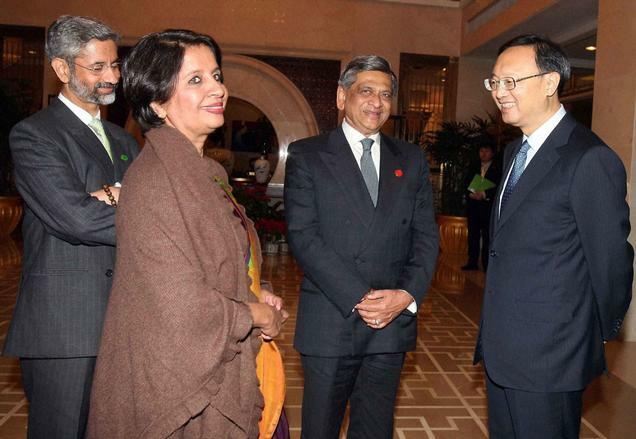 The Ambassador said that China has changed its assessment of India and holds that India has become reactionary. Yesterday the Foreign Secretary said India’s foreign policy has not essentially changed for the past 15 years. We welcome this promise. If one is to speak of any changes in both sides’ estimation of the other, one must first say that it is India that feels there has been a great change in China’s domestic and foreign policy. China’s national leaders have not voiced any objections whatsoever to India’s domestic and foreign policy. The Indian side says it does not know what changes there have been to Indian foreign policy. But judging from actual behavior, one cannot help but feel that there has been a change. When Sino-Indian relations were good, India held that China was interested in peace. But since last year, India’s leaders have repeatedly implied that China is keen on [having a] cold war. An Indian leader even said he did not know of any country that loved peace as much as a certain country does, nor did he know of any country that loves peace less than China does. As for China’s domestic policy, the deputy head of India’s Foreign Ministry, Mrs. Menon, once said that China is a concentration camp, a Hitler-style totalitarian regime. China’s leaders do not want to make direct criticisms of India. Yesterday, Vice-Premier Chen Yi raised the point that both sides should [try to] lessen the differences of opinion and do their best to find common points, reducing differences and preventing them from surfacing. The Ambassador says that the main focus should be on border issues; when Premier Zhou visited Delhi last year, it was in the very hopes that it would lead to a resolution of border issues. Over the past two years we have negotiated about borders with Burma and Nepal, and achieved resolution through friendly consultation. There has been development in relations with both [these] parties, as the Ambassador also knows. Parthasarathy: I still do not have a precise enough understanding of some of the issues discussed yesterday. India has a right and a responsibility to represent Bhutan and Sikkim in handling foreign affairs; what is China’s attitude toward this? Zhang: Yesterday, the Foreign Secretary raised this question under the subject of border issues. There are no problems between China and Sikkim in terms of borders. There are already stipulations [regarding them] in a late 19th-century agreement. With the exception of a small area south of the McMahon Line, there is not much disagreement on the Sino-Bhutanese border, either. I will say it again: [China] does not cross the McMahon Line - the problem is in fact nonexistent. The Ambassador raised the [subject] of India’s right to represent Bhutan and Sikkim in diplomatic negotiations; this went beyond the scope of border issues. The Foreign Secretary says India has a special relationship with Bhutan and Sikkim; [I] don’t know what this refers to. Parthasarathy: This was stipulated on the basis of a treaty. Based on two-way treaties, Bhutan and Sikkim agreed to accept India’s guidance on foreign relations and to have India handle foreign affairs. What are the implications in China’s saying it respects “proper” Indian relations with Bhutan and Sikkim? recover them. This does not merit a response. China’s leaders have never said this kind of thing. India has a general consulate and other agencies in Tibet; they can find out that there is no such talk or activities. India is just basing itself on reports from Western news agencies; it is not worth taking seriously. That we did not reply does not mean we affirming this. Parthasarathy: We were not basing ourselves on Western reports, but on our own intelligence. It is said that you broadcast this news. We consider this to be a serious matter, [so] we brought it up with you. Now you say this didn’t happen, but it is also possible that irresponsible people did say such things; you can also investigate. We would not criticize you based solely on Western reports. As for [your] saying, “protectorate,” this is not a very accurate term (A LOOSE TERM) . This is, in fact, a historical relationship; based on the stipulations in the treaty, they ask us to offer guidance in foreign diplomacy. China’s saying that it respects a “proper” relationship has made people doubtful as to whether you respect the India-Bhutan and India-Sikkim treaties, or whether you recognize India’s right to represent Bhutan and Sikkim in foreign diplomacy. Zhang: You say India’s criticism is based on Tibetan broadcasts, but you have never supplied specific information. Your letter was very vague, [and] you have long since made general statements that there was no such thing [happening]. Regarding [India’s] traditional relationships with Bhutan and Sikkim. India says that based on the treaty, only India has the right to handle their foreign relations. But Bhutan and Sikkim are also in communication with Tibet. For the moment [we] won’t speak of the historical relationships; in recent years, there have also been communications. For example, they have representatives stationed in Tibet. Their representatives have remained there following the India-Bhutan and India-Sikkim treaties; this is a fact. It is very clear what we mean by saying we respect India’s relations with Bhutan and Sikkim; we are very cautious, and unwilling to damage China’s relations with Bhutan or Sikkim. We also do not [want to] damage China’s relations with India. The two countries have not, in official meetings (unterm.org: “??? ?”) discussed Sino-Bhutanese or Sino-Sikkimese border issues, because at the time the two countries’ premiers were only authorized to discuss Sino-Indian border issues; nor did India in any way believe Bhutan or Sikkim to be part of India. As regards the Indo-Bhutanese treaty, India and Bhutan’s explanations are mutually contradictory; Bhutan believes they have the right to handle foreign affairs. In any case, we do not have any diplomatic contacts with them. Generally speaking, the tension in [our] two countries’ relations over the past two years has concerned Sino-Indian border issues. [China] has made great efforts to alleviate [tensions] and seek ways of resolution. You say that India is doing this, too. That’s good, but now India tends to sideline Sino-Indian border issues and instead focus discussions on the issues of Bhutan, Sikkim and Pakistan, etc; this will not serve to narrow [our] differences of opinion – rather, it will broaden [our] differences of opinion. This does nothing to help resolve the issues. Our chief consideration should be Sino-Indian border issues; there is definite danger with this aspect, and none at all with the other issues. Yesterday the Foreign Secretary said that the borders ought to be considered as a whole, starting with Kashmir and ending with Burma. Here one should not overlook the fact that there also exist third-party nations, such as Nepal. We respect India’s relations with Bhutan and Sikkim and have done nothing to damage [them]. We recognize the Sino-Sikkimese border and do not see any necessity for further mention of this issue. If [India] has ulterior motives [in raising this issue], then at the very least they lack understanding. We cannot confuse primary [issues] with secondary ones. Parthasarathy: I am personally surprised that the issue is getting bigger. It was our hope that the issue could be limited to the scope of Sino-Indian border issues. But the difficulty lies with your use of this term “proper relations”. During Sino-Indian official meetings, you also refused to discuss the Sino-Bhutanese and Sino-Sikkimese borders. We should first discuss issues of substance. [We] would like to ask whether the Chinese side would agree to talk if Bhutan entrusted India with discussing Sino-Bhutanese border issues. This is the crux of the issue. As for the Kashmir issue, India is very sensitive about it. You are discussing border issues with a country that has no right to negotiate; it is impossible not to consider this hostile. Yesterday Premier Zhou raised some practical issues, but from a legal standpoint, two countries cannot discuss the territory of a third country; [they] ought to be mindful of popular opinion. Zhang: India believes China has a hidden agenda concerning Bhutan and Sikkim and is expanding the issue; this idea is strange and hard to understand. China has done nothing in this aspect over the past two or three years. Our relations with Bhutan and Sikkim have not increased - they have decreased. 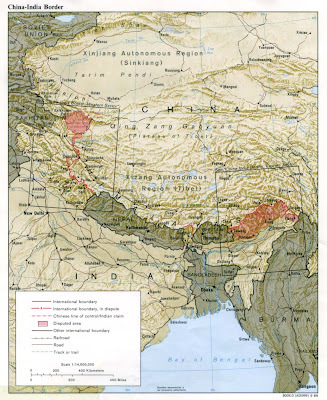 The main disagreement over the Sino-Bhutanese border map is [the area] south of the McMahon Line. Currently the two sides are at an impasse on the McMahon Line. India’s submission of a letter demanding discussion of the Sino-Bhutanese border, and also touching on the McMahon Line, only expanded the quarrel – [it was for this reason] we did not reply. As for the Kashmir issue, Premier Zhou has repeatedly discussed, in clear-cut terms, our position and predicament. There is nothing to add. The Ambassador recognizes that China can, when necessary, be in temporary contact with the local authorities. This is also a recognition that there are practical problems that must be handled. But this idea of the Ambassador’s still cannot resolve the practical difficulties. We could not wait until after bloodshed occurs to talk; this would create new tensions and be detrimental to our relations with neighboring countries. This will only cause the imperialist elements intent on destroying China’s relations with neighboring countries to clap their hands for joy. difficult for the two sides to have total consensus on the facts, but this is no barrier to seeking resolution on practical problems provided it does not harm the interests of either side. Both sides [can] yield to and forgive the other – this is also the normal way [of doing things]. Officials’ reports from both sides deserve regard, but one cannot get tangled up in the details. The relationship between our two countries is too important; we should view it from a greater distance, from an elevated height, considering the big picture, and seek resolution. The two sides will not necessarily agree on specific views, but should understand the overall spirit. Parthasarathy: This is a difficult problem. For the two sides to have consensus on the facts is difficult. In truth, what the officials presented was not one report, it was two reports. The officials were assigned to examine and double-check the [written] information, determining the points [we] agree on and those we do not, but the result was completely divergent viewpoints. How are the two countries’ premiers to consider [the issues] with two piles of completely opposing facts? [My] personal view is, might it be possible to seek a solution starting with ascertaining those points that require further clarification? Zhang: After India issued the officials’ report, Premier Nehru flatly stated that there could be no discussion unless India’s requirements were accepted. Under these circumstances, China prefers not to state its stance for the time being, unless we are prepared to squabble. Regarding the officials’ reports, I believe that besides the differing points, there are certain portions on which [we] agree or are relatively close. Our side once suggested writing this, but the Indian side refused. As for China’s border negotiations with Burma and Nepal, there is some experience that can serve as a reference. Ordinarily speaking, when there is disagreement on the facts, there are two possible methods of resolution: (1) If the two sides both have definite grounds [for their stance], following an earnest, objective comparison, [they] can determine which side has somewhat greater grounds, and consider from a political standpoint which [country] finally getting the [land] would do more for peace and the two countries’ relationship. (2) If the two sides’ views differ greatly and it is impossible to bring them into line, each can keep to its own position and consider, from a political standpoint, what kind of resolution would be more beneficial. Of course, the differences of opinion between China and India are somewhat greater, but the importance of Sino-Indian friendship is also far greater; both can continue to think about whether there is anything else to consider. The two sides should meet halfway - it is possible to resolve the issues. China and India cannot stay locked in long-term mutual confrontation; there must eventually be peace and friendship. As long as both sides have the desire, the question of method is an easy one to resolve. [I] won’t speak of the past; yesterday’s talks prove that we are willing to resolve the issues. Great news! Aung San Suu Kyi, the 1991 Nobel Peace Prize Laureate has finally been freed. The Burmese junta has decided to release Aung San Suu Kyi who has spent nearly 20 years in various forms of detention. She won democratic elections and dared to raise her voice against the oppressive military regime. The 'largest democracy in the world' remained silent all these years. I post here an article published in Rediff.com in 2005. This is no spaghetti western. This is a real story from Danubyu, Myanmar. April 5, 1989, two months before the Tienanmen Square massacre in nearby China. A woman walks down the middle of the street, accompanied by several men. Six soldiers of the State Law and Order Restoration Council -- the junta which had crushed the democracy movement and killed thousands of people in Rangoon a few months earlier -- order the group to stop. The group pays no heed. A young army captain whips out his revolver and jumps out of his jeep, ready to open fire. In the nick of time, a major intervenes, and asks the captain to hold his fire. The lady walks on. She is Daw Aung San Suu Kyi, the Iron Lady of Burma. 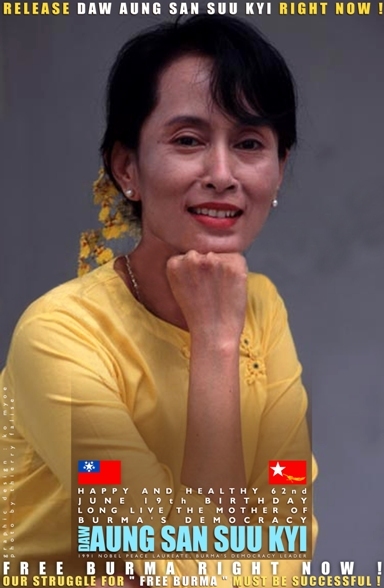 The fearless daughter of General Aung San, the hero of Burma's freedom struggle, turned 60 June 19, thereby completing a full cycle according to the Buddhists who follow the 5 elements and 12 animals calendar. For the past 16 years, Suu Kyi has only seen the inside of the jails, been under house arrest or forbidden to freely travel in her own country. But she has always remained faithful to her principles: a non-violent championship of democracy. At a time when role models are a rarity, Suu Kyi is one of the very few persons on this planet whose life can be an inspiration; she is the embodiment of a rare value in this often immoral world: the freedom of the spirit. Is it a coincidence that another Nobel Laureate, who like her has become a role model for the youth, has also written about 'freedom'? Freedom In Exile is what the autobiography of Tenzin Gyaltso, the Dalai Lama of Tibet, is titled. Suu Kyi collected writings are: Freedom from Fear. For decades, the countrymen of both these exceptional beings have not known the taste of 'outer freedom'. Next month, the Dalai Lama will?celebrate?his 70th birthday with 46 years of just 'inner freedom.' The 'little sister' completes 16 years of a similar fate. Another thing Suu Kyi and the Dalai Lama share is their long association with India [ Images ], an India which has rarely shown any sympathy for their political cause despite the great principles that its leaders swear on. Aung San Suu Kyi was born June 19, 1945 in Rangoon to General Aung San and Daw Khin. The general was one of the 'Thirty Comrades' who spearheaded the Japanese advance into British Burma, before turning against the Japanese and finally negotiating Burma's independence with the British. Just as he was taking over as the first head of the Burmese State, General Aung San was assassinated. It was the first national tragedy. Suu Kyi was only two years old, but this event marked her deeply for the rest of her life. It is as if she had a debt towards her nation and an obligation towards her father. In 1960, her mother Daw Khin Kyi was appointed Burma's ambassador to India. Suu Kyi, a young girl of fifteen with long thick plaits, joined Lady Sri Ram College in Delhi. 'Her circle of Indian friends widened. This was a wonderful opportunity to explore and understand the country of Mahatma Gandhi,' recalls a family friend and diplomat, Ma Than E.
Apart from college, Suu kept busy with Japanese flower arrangements, piano classes or riding lessons. She also got to know Indira Gandhi's children, Rajiv and Sanjay. In 1964, Suu went to Oxford where she studied for three years to earn a BA in philosophy, politics and economics. Later she got her first work experience as an assistant secretary in the United Nations Secretariat. 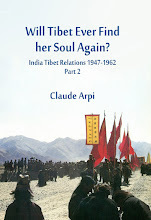 Her life took another turn when she met a young and brilliant British scholar, Dr Michael Aris, whose expertise was the Tibetan Buddhist tradition. Her life as a mother of two sons and a scholar continued smoothly during the following years. She was separated for some time from her family when in 1985, she decided to learn Japanese and work as a visiting scholar at the Center for Southeast Asian Studies in Kyoto University. In 1987, the family was reunited and she was back in India. For two years, Dr Aris conducted a research on 'A Study of Buddhist Hagiography' at the Indian Institute of Advanced Studies in Simla. It was an excellent occasion for her to master the political and spiritual thoughts of Swami Vivekananda, Sri Aurobindo, Tagore, Gandhi or Radhakrishnan. After traveling extensively through the Himalayas and writing on India's age-old traditions of peace and tolerance, the couple returned to London in early 1988. 'Would you mind very much should such a situation ever arise? How probable it is I do not know, but the possibility is there?' Suu had once written to Michael. Fate caught up with her in March 1988. Her mother had a stroke in Burma and Suu had to immediately leave England for her country. A few months after her arrival in Rangoon, the old military dictator General Ne Win resigned, triggering a dynamic pro-democracy student movement. Soon millions of Burmese joined in their demand for a true democracy. This culminated on August 8, when thousands of demonstrators were massacred by the army, perhaps a prequel to the Tienanmen Square incident which happened less than a year later. The time of reckoning had come for Suu Kyi. 'Her knowledge of the Burmese heritage, her wonderful fluency in her own language, and very important, her refusal to give up her own Burmese citizenship and passport? all these factors conspired with the sad circumstances of her mother's final illness to make her engagement unavoidable,' her husband later wrote. On August 26, 1988, she addressed one million people assembled at the Shwedagon Pagoda in Rangoon. She thus became the leader of the opposition National League for Democracy?which till today opposes the military junta. The following months saw her criss-crossing Burma and addressing hundreds of meetings; the incident reported at the beginning occurred at this time. The junta was becoming more and more nervous and finally on July 20, 1989, she was arrested. 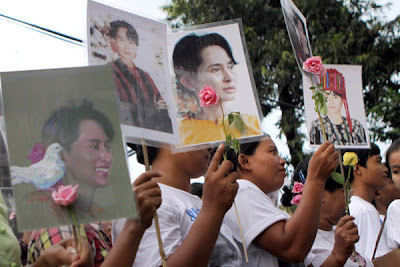 On the eve, she had cancelled a mammoth rally on the occasion of the Martyr's Day (which marks General Aung San's assassination), as the army had threatened to shoot at the crowd. From that day onwards she has spent most of her time in jail or in confinement ('protective custody' as the junta nicely calls it). In May 1990, despite her continued detention, her party won a landslide victory in the general election; the NLD secured 82 percent of the seats. But till today the generals have refused to validate the results of the election. In 1991 she was awarded the Nobel Peace Prize, but her fortune did not improve. During the following years, despite appeals from the US president, the UN secretary general, the Dalai Lama, other Nobel Laureates and thousands of other personalities from the West and Asia, nothing has moved the junta. The most tragic event is perhaps the death of her husband in March 1999. Though she had not seen him since 1995 and he was dying from prostate cancer, he was refused a visa and not allowed to visit her a last time. Suu Kyi could have left Myanmar to see him, but it was clear that the junta would not have allowed her to return. Forced to choose between her husband and her country, she opted for the latter. What has given the junta the strength to resist world pressure and keep Aung San Suu Kyi behind the bars of her home for 16 years? Look to the North; it is the same regime which forced the Dalai Lama to flee his country in 1959. In China, the Communist/capitalist regime (which smashed its own children in 1989 in Tienanmen) is terrified of the word Suu Kyi lives by: Freedom. There is no doubt that without Beijing's active support (and with India's failure to take a stand in accordance with her professed principles), Burma would today be a democracy. 'Always one to practice what he preached, Aung San himself constantly demonstrated courage -- not just the physical sort by the kind that enabled him to speak the truth, to stand by his word, to accept criticism, to admit his faults, to correct his mistakes, to respect the opposition, to parley with the enemy,' says Suu Kyi about her father. Whether or not she lives to see her dream materialise, Suu Kyu will live on forever in the minds of those who champion freedom of the spirit. Is it enough to just watch? Could they attack India soon?